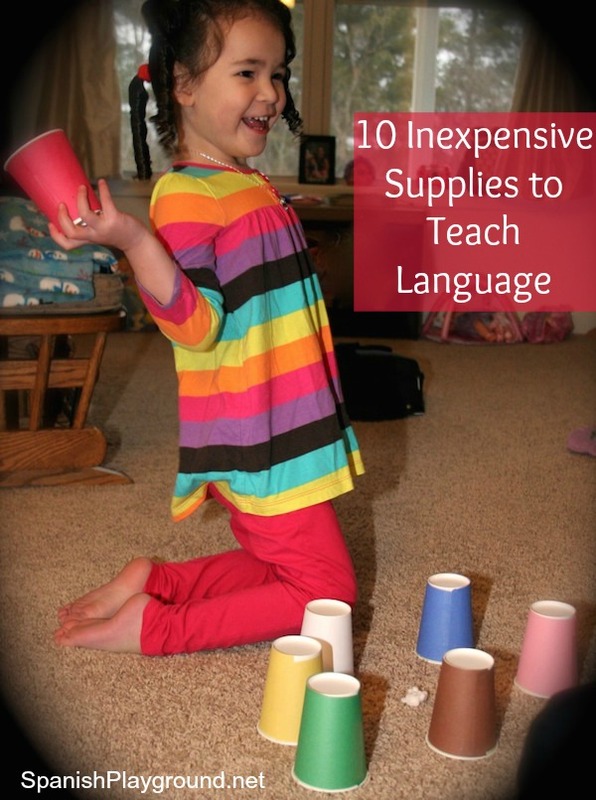 I use these 10 supplies to teach language all the time and can usually make them work with whatever content I am teaching. Finger puppets are easy to make and perfect for getting kids talking as they act out simple interactions. They are wonderful supplies to teach language and you can find lots online. Finger puppet characters from stories – These finger puppets are from Inkless Tales. There are characters from Little Red Riding Hood and The Three Bears. You can use these puppets to teach greetings and tell other stories too. I love puzzles as a language activity for working with small groups. As you do a puzzle, there is lots of opportunity to talk about the picture. This printable list of vocabulary for doing puzzles is helpful. Stickers are great supplies to teach language. They work for creating scenes and you can find them to fit lots of different themes. You can put them on stones to make story-stones or do activities where you put then on body parts. A sticker can also create a story in a mini-book. Read more about sticker mini-books. Wordless picture books are a wonderful resource available at any library. You can tell these stories at any level. Read more about using wordless picture books to teach Spanish here. 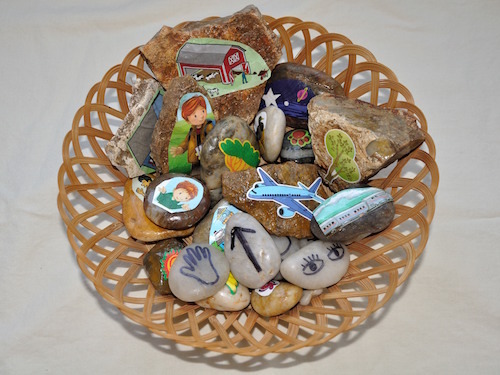 Whether you are using them for counting, stacking, or telling stories, rocks are fun. You can paint them with words, letters or shapes. I make story stones with pictures cut from magazines and Mod Podge. Do a Pinterest search for crafts or activities with rocks and stones. Printable sequence cards are really short, simple stories told in pictures. You can find them for all kinds of themes and you can use them to structure language tasks for kids at any level. Here are two collections of sequence cards and you can find of these supplies to teach language online. Sequence card links from Talibiddeen Jr. These small animals are wonderfully versatile. They are perfect for telling stories and playing hiding games. We count them, toss them and balance them on different body parts. I use them in one way or another in many of my preschool lessons and the kids never get tired of them. I use paper cups for sorting, stacking and lots of simple crafts. They are also very useful for hiding games and as containers. With just eyes, they become a creature or a puppet. A Pinterest search will give you lots of inspiration for ways to use paper cups as you teach language. I have small, brightly-colored clothes pins and also wooden ones. They are a fun way for kids to mark answers (see these number and letter printables and this snowman activity). They also are great for crafts as they become puppets, the legs on animals, or the mouth of a crocodile. In addition to all the crafts you can make with paper plates, they are excellent for gross motor games. I write words on them and use them as targets for bean bag toss, or spread them out and have kids find the rhyming words. They work well outside because they are a good size and weight. You can also put words or letters around the edge and kids can fold them down as a response. Here is a grocery shopping list activity that I wrote about for Spanglish Baby that will give you an idea of what I mean. Your ideas are great! Thanks for sharing them with the rest of the world. Mis materiales favoritos son las bolsas de papel cafés y los títeres que vienen listos para imprimir y pegar en ellasl. A los niños les encantan! Cuando usan los títeres se sienten más relajados al hablar y también más creativos.